When we think of shopping in Hawick, it’s probably top quality cashmere and lambswool knitwear which would come to the visitor’s mind first, but that would be only one part of the story. The town also has a remarkable number of purveyors of food and drink, in traditional small shops on and around its High Street. Butchers’ shops abound; testament to the age-old rearing of high quality beef and lamb in the surrounding hills. Lindsay Grieve, Heritage Meats, Hutton’s, and the two shops of Robert Pringle will entice you in with a full and varied window display. George McCulloch’s fishmongers on High Street will offer you the best of the day’s North Sea catch. Meanwhile traditional bakers such as the Home Bakery and shop in Howegate, or Hunter’s of Lochpark who supply several small local general stores, will cater for your needs from the more basic bread and rolls to the cakes and pastries sought for the sweeter-toothed. You might also want to pop in to Turnbull’s, near The Horse. This is a delicatessen which has interesting food and drink items for sale, while also offering coffees etc. and light meals. It’s always risky to mention such shops by name, as maybe we’ve missed one, but we’re proud of these businesses. 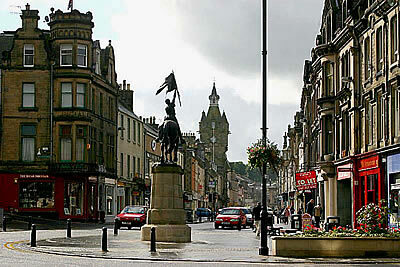 They echo that long history of Hawick as a busy town with a thriving High Street, catering for all needs. These family-run shops manage to compete with the better-known supermarkets and preserve the traditional style of shopping. The town is well served by the bigger stores. Strictly in alphabetical order, Farmfoods, Iceland, Lidl, Morrisons, Sainsbury’s, will deliver the wider shopping experience, and parking is never a problem nearby. So where will we eat tonight? A Friday evening? A Saturday? A special occasion? Decision time. The first question might be: ethnic or traditional? Hawick has a range of Chinese, Indian, Italian restaurants to eat in, or for a takeaway. There are also many more familiar menus on offer. On the basis that venturing out of town might give the diner (or at least the wine-drinker) a transport problem, let’s stick with eateries within the bounds of the town. 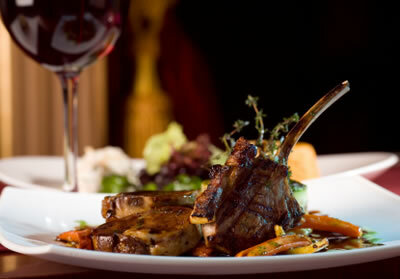 Elm House Hotel and Mansfield House Hotel offer lunch and dinner throughout the week. For other locations, it might be better to check out opening hours by telephone with the establishment, as some might have days off. Popular venues include the Buccleuch Restaurant, Mayfield Bar, The Night Safe Bistro, Sergio’s, Thorterdykes, and JD Wetherspoons (The Bourtree). The websites for some of these can be found below, but googling the others will bring reviews and location maps. Maybe you’re just a day visitor however and looking for a coffee or a light bite at lunchtime. There is certainly no shortage of cafes or coffee houses. The Almond Tree, Damascus Drum, Pickled Orange, Sonia’s, Tower Inn, Tower Mill, Turnbull’s would all welcome you. Morrisons and Sainsbury’s supermarkets have cafes. Meanwhile why not visit Johnston’s of Elgin in Mansfield Road and combine your light bite or coffee with looking over their knitwear. Mention the name Hawick, and what immediately springs to mind – Common Ridings, Rugby, or Knitwear. But what about Hawick’s other claim to fame – Hawick Balls. Ever since Bonnie Agnes Lamb started making them in the late 1800’s, the recipe for this world famous sweet has remained a closely guarded secret. 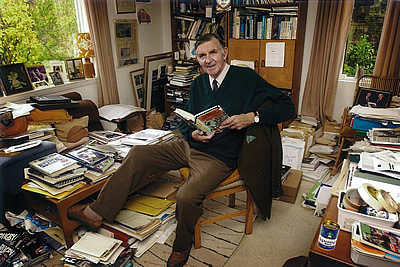 A particular favourite of the late rugby commentator, Bill McLaren, who used to reckon that sucking a Hawick Ball the night before an international gave you that extra bit of edge, they are very much the sweet of choice – round, boiled, sweets, at the same time, both minty and buttery. Whether commentating or reaching, Hawick Balls were always within Bill’s easy reach. They’ve inspired others too – one of Hawick’s other famous sons took them on his voyages round the world, and they’ve even ended up at the South Pole! But you don’t have to go that far to get them – they’re available from many retail outlets in the town and on line.